Svaka kapsula sadrži 200 mg ekstrakta cimeta u omjeru 10:1, što odgovara 2 000 mg sirovog, začinskog cimeta, te 3,5 mg cinka i 50 µg kroma. Cinnamon is one of the oldest plants in the world. Brown, aromatic powder made of crust of cinnamon tree is considered to be very valuable for thousands of years. The capsule also contains trace elements of chromium and zinc. Chrome helps maintain normal blood sugar levels. Zinc helps maintain proper carbohydrate metabolism and helps maintain good vision. Very useful for diabetics! 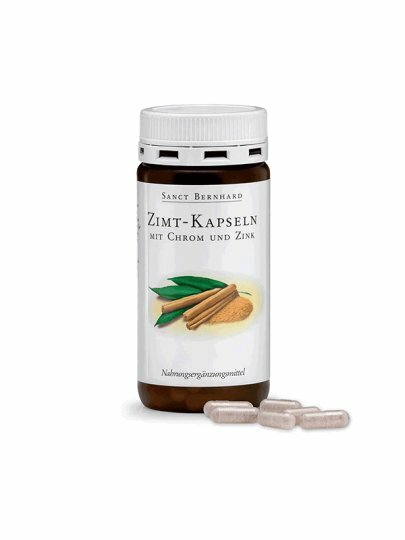 Each capsule contains 200 mg of cinnamon extract in a ratio of 10: 1, corresponding to up to 2,000 mg of crude, seasoning cinnamon! The capsule also contains 3.5 mg of zinc and 50 μg of chromium. Drink 2 capsules a day, along with food.